STILLWATER, Okla. (AP) — It could come down to defense on Saturday for No. 25 Oklahoma State when the Cowboys face Iowa State at home. The Cyclones‘ offense has struggled this season, ranking last in the Big 12 in both scoring and yards this season. Oklahoma State (4-1, 1-1) will unleash the pressure of its potent pass-rush that leads the nation in sacks. The flip side of that, though, is the defense for Iowa State (1-3, 0-2) has been excellent, ranking third in the Big 12 in both scoring (allowing 20 points per game, 33rd in the nation) and yards (333.3, 30th). In conference play, the Cyclones nearly pulled off an upset of No. 7 Oklahoma on Sept. 15, eventually falling 37-27, and then lost 17-14 to TCU last week on a field goal with 37 seconds left. 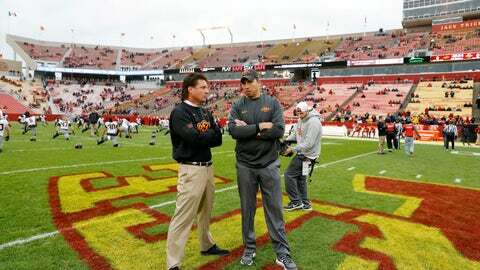 As for the Cyclones’ attack, which generated just 198 yards of total offense last week and averages just 17.5 points per game, worst in the Big 12 and 123rd in the nation (out of 130 FBS schools), coach Matt Campbell believes they are trending in the right direction. 1. BIG BAD WOLF: Sophomore Landon Wolf entered last week’s game with four career receptions for 41 yards, but he delivered when needed. Jalen McCleskey left the team with the intention of transferring, and Dillon Stoner was out with an injury. But Wolf stepped up in Oklahoma State’s 48-28 win over Kansas and led the Cowboys with six receptions for 116 yards and a touchdown. With Stoner’s status for Saturday still uncertain, Wolf’s contributions will again be needed. “He did a great job of stepping in and carrying that load,” Gundy said. 3. SACK ATTACK: Oklahoma State leads the nation in sacks by a wide margin, having compiled 24 so far this season, five more than second-place Ohio State. The Cowboys are led by junior defensive end Jordan Brailford, whose seven sacks is tied for the national lead with Notre Dame’s Jerry Tillery. Brailford is also third in the country with 2.1 tackles-for-loss per game. 5. RUNNING DOWN HILL: Running back Justice Hill, coming off a game in which he gained 189 yards and a touchdown on 31 carries against Kansas, will again be a focal point of the Cowboys’ offense. The conference’s leading rusher (ninth in the nation) with 577 yards and six touchdowns, Hill equaled a Big 12 record by scoring a touchdown in 11 consecutive contests.